A co-worker of mine brought me a paper bag full of lemons from his tree. As a thank you, I made him this lemon pie. While making this pie, I became convinced that the 'lemons' gifted to me were not really lemons, but some sort of hybrid. Their soft skin was too easy to zest. They smelled sweet and herbaceous, not sharp and acidic. A taste didn't cause my lips to pucker. Regardless, I continued to make the pie. Later, I played the game of fruit detective. 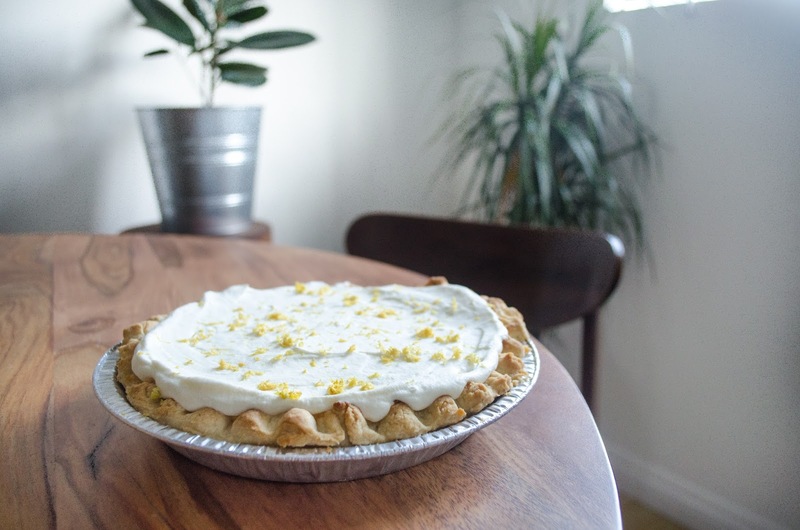 I discovered that I had made a Meyer lemon pie. Meyer lemons are a cross between a lemon and a mandarin orange. The soft skin, the sweetness, the scent of bergamot - it all makes sense now. Meyer lemons reach peak season November - March. Apparently, in Southern California, they're still growing on trees in May. If you have easy access to this awesome fruit, fantastic. If not, you can sub. 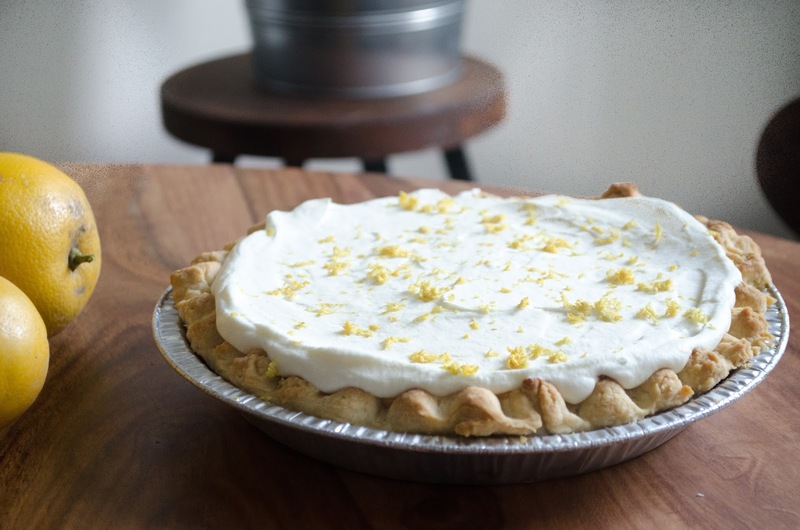 regular lemons and still make tasty citrus pie to serve at your Memorial Day BBQ. (Hopefully, you'll be enjoying this pie while I work and try my best to not be jealous of everyone's 3-day weekend)! Make the crust: in a large mixing bowl, combine the flour and salt. Cut the butter into small cubes and use your hands to rub it into the flour. When the butter pieces are pea-sized, add the cold water and use your hands to mix until a dough forms. Shape the dough into a ball and flatten into a patty. Place is the freezer for 5 minutes to firm up. Roll the dough into a circle and lay into a 9" pie pan. Pinch the sides of the crust and poke holes all over the bottom with a fork to prevent air pockets during baking. Bake for about 15 minutes or until light golden and crisp. Make the filling: combine granulated sugar, cornstarch, and water in a large saucepan. Turn the flame on high and whisk constantly while the mixture comes to a boil. In about 5 minutes, the mixture will thicken and turn into a gel. Remove from the stove and stir in butter until it melts and combines thoroughly. Set aside. In a separate bowl, mix the egg yolks with the lemon zest and juice. Return the saucepan over the stove on medium heat. Add the egg yolk mixture to the saucepan and whisk constantly for about 10 minutes or until the curd filling reaches 180 degrees. Remove from heat and set the pan into an ice bath to cool. Make the whipped cream: Use an electric mixer with a whisk attachment or a hand whisk to whip the cream with the sugar and vanilla extract until soft peaks form. Pour the cooled lemon curd filling over the pie crust. Then, spread the whipped cream on top. Sprinkle with lemon zest to garnish. Refrigerate until ready to serve. Store refrigerated for up to 5 days.